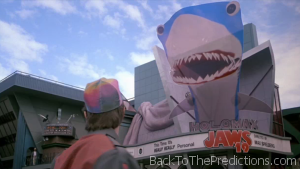 Maybe Katy Perry is a big fan of Back to the Future. 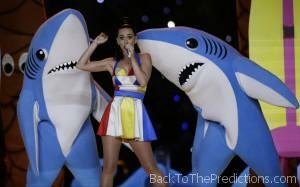 That would explain why she performed at Super Bowl XLIX with a couple of dancing sharks that looked a lot like the holographic shark seen in Back to the Future Part II. Did the creators of the film correctly predict that we’d see large blue and white sharks in a major performance in 2015? Yes. They did. Sure, it’s not holographic and it’s not Jaws 19, but yet there they were dancing around Katy Perry during halftime. Then again, the team behind Back to the Future may have been big fans of Jabberjaw. That show was set in the year 2076. 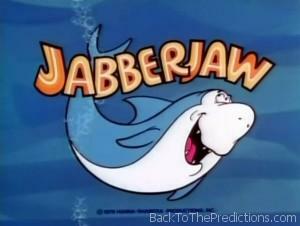 If the timeline is correct, these Katy Perry sharks are just going to increase in popularity so much that they will star in Jaws films throughout this year and then one will become a drummer in a band by 2076.